Combined cleaning and polishing paste for acrylic, polyester and fibreglass surfaces - Acid free, Eco-Friendly! Suitable for removing light scratches on bathtubs, washbasins, sinks, shower trays etc. Acryl-Star has been especially formulated to be completely compatible with acrylic surfaces.The Acryl-Star cleaner and polishing paste removes lime deposits, discolouration and heavy soiling by the use of a special polishing powder. Existing scratches can also be removed. The application does not develop an unpleasant or noxious smell. For use on acrylic, polyester and fibreglass surfaces. Until now, two different products were needed for the daily cleaning and maintenance of acrylic surfaces and for removing scratches and wear and tear. Acryl-Star cleaning and polishing compounds advanced composition satisfies both demands. 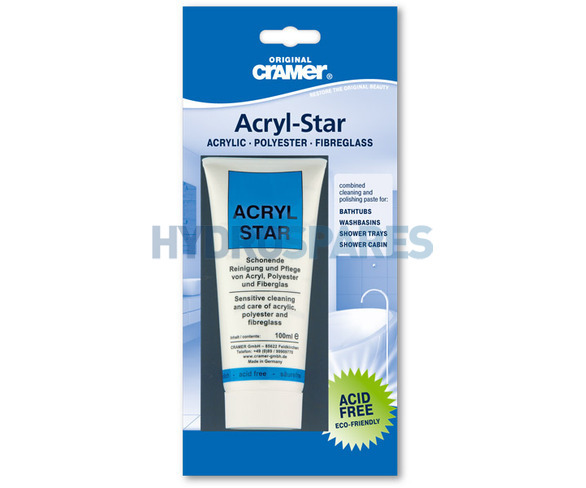 The Cramer Acryl-Star removes lime, discolouration and tough deposits without scratching. The cleaning technique is based on a combination of the right detergent with a special polishing compound. Existing minor scratches are removed. Use undiluted with a soft cloth to achieve a high gloss finish. Apply the paste with a soft moist cloth or sponge, rub in and then rinse off with warm water. Light scratches can be removed with the Acryl-Star only, deeper scratches must be sanded, with the sandpaper included, before polishing. First use the 800 Grade ( the more abrasive one) wet/dry sandpaper, in a straight direction not in circles, with water. After removing the existing scratches, clean the area. Now use the 1200 Grade wet/dry sandpaper with water, for this sanding change direction about 90degrees and sand the area well to give a smooth matt surface. For perfect results it is important to do this accurately. Apply the paste on a soft cotton cloth and polish the area under light pressure in circular direction to give the perfect finish.